Christine Hallquist thanks supporters during an election-night victory speech on Aug. 14. Hallquist's campaign said she's received several threatening correspondences since she won the primary. Hallquist, the first openly transgender person to win a major party gubernatorial nomination, generated headlines around the world with her win last Tuesday. Hallquist’s communications director, David Glidden, said the attention has not all been positive. It’s those threats that involve violence that have become of most concern to the Hallquist campaign, according to Glidden. Vermont State Police are now investigating several threatening emails, social media messages and phone calls. “Christine and I had a meeting with them last night to go over sort of options now and should this escalate, ... should actionable threats start coming in, things like that,” Glidden said. Adam Silverman, the public information officer with Vermont State Police, said the agency is working on two fronts now. “One is investigating the threats themselves, and then two is ensuring the candidate’s safety,” Silverman said. Silverman said he’s not at liberty to disclose the security measures that have been taken by Vermont State Police on Hallquist’s behalf. Silverman said many of the threats likely originated from outside Vermont, and that federal law enforcement authorities are helping with the investigation. “Certainly we’re working with the FBI … Once you get outside of Vermont, that’s not a Vermont State Police matter anymore,” Silverman said. Glidden said the threats weren’t a surprise: "We unfortunately knew it was likely coming." But, Glidden said, the threats have not impeded campaign operations. 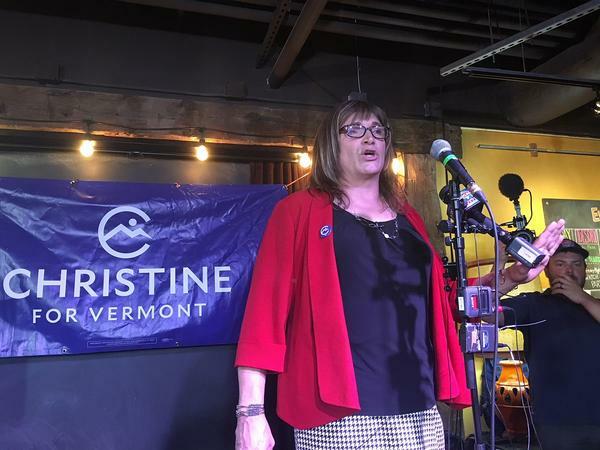 A midsummer primary in one of the smallest states in the country took on historic national significance Tuesday night when Christine Hallquist became the first openly transgender candidate in U.S. history to win a major party gubernatorial nomination. Tuesday, August 14, is primary election day in Connecticut and Vermont. In Vermont, voters have big decisions ahead for governor and the U.S. House.